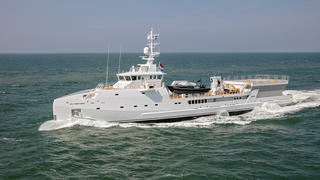 The 69.15 metre Damen superyacht support vessel Game Changer has been sold and will return to Gorinchem for modifications, the Dutch yard has confirmed. Built on speculation and launched in February 2017, Game Changer is capable of carrying an 11.3 metre Wajer tender, a 10.5 metre Damen RIB and a U-Boat Worx submersible on the main deck. She is based on the same patented Damen Sea Axe hull as 6711 and Garcon, but with a 2.04 metre stern extension to allow for a helicopter hangar. Game Changer's key features include 250 square metres of open deck space for storing tenders and water toys via the large deck crane with a lifting capacity of 15 tonnes. A further 110 square metres of air conditioned storage space below decks creates the perfect spot for a dive centre. What’s more, Game Changer boasts a fully certified superyacht helipad, which means that owners can travel with a larger helicopter and land in a wider range of weather conditions. With deep provision storage and quarters for 22 crew and staff, Game Changer is described by the yard as a "crew paradise". 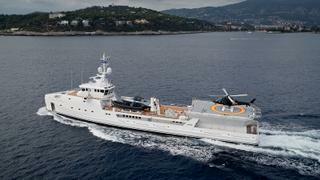 She is ideal for recuperation between shifts on the mothership, with a spacious mess area and a superyacht gym on board. Power comes from four 3,000hp MTU 16V4000 M63L diesel engines for a top speed of 20 knots and a maximum cruising range of 4,500 nautical miles at 16 knots. 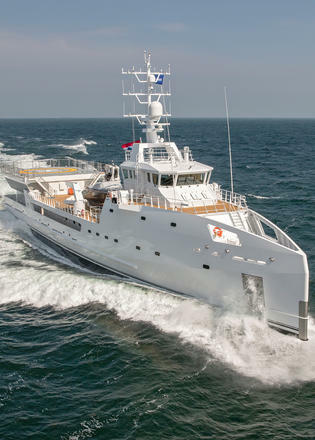 Other superyacht projects currently under development at the Dutch yard include the 55 metre YS Adventure 5009, which is due to hit the water this summer, and the 65 metre SeaXplorer — a scheduled 2019 launch. 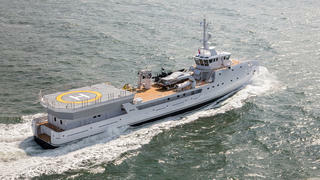 Looking even further ahead, Damen plans to launch its 75.15 metre SeaXplorer project in 2020.